Mugwort (Artemisia vulgaris) also known as common artemisia, felon herb, St. John’s herb, chrysanthemum weed, sailor’s tobacco, and moxa is a perennial member of the Compositae family, and a close relative of wormwood (Artemisia absinthium L.). Mugwort’s generic name is from that of the Greek moon goddess Artemis, a patron of women. Mugwort has long been considered an herbal ally for women with particular benefit in regulating the menstrual cycle and easing the transition to menopause. The common name may be from the old English word moughte meaning “moth,” or mucgwyrt, meaning “midgewort,” referring to the plant’s folk use to repel moths and other insects. Mugwort has a long history of folk tradition and use. Anglo-Saxon tribes believed that the aromatic mugwort was one of the nine sacred herbs given to the world by the god Woden. It was used as a flavoring additive to beer before hops (Humulus lupulus) became widely used. Mugwort is considered a magical herb, with special properties to protect road-weary travelers against exhaustion. The Romans planted mugwort by roadsides where it would be available to passersby to put in their shoes to relieve aching feet. St. John the Baptist was said to have worn a girdle of mugwort when he set out into the wilderness. Some of the magic in mugwort is in its reputed ability to induce prophetic and vivid dreams when the herb is placed near the bed or under the sleeper’s pillow. In Pagan ceremony, a garland or belt of mugwort is worn while dancing around the fire during summer solstice celebrations. The herb is then thrown into the fire to ensure continued protection throughout the coming year. Mugwort is a tall and hardy European native with stout, angular, slightly hairy stems tinged with a purple hue. Leaves, which may be as long as 4 in (10 cm), are deeply divided with numerous lance-shaped, pointed segments, which may be toothed or entire. They are arranged alternately along the erect, grooved stem and are a dark green on top and pale green with downy hairs on the underside. 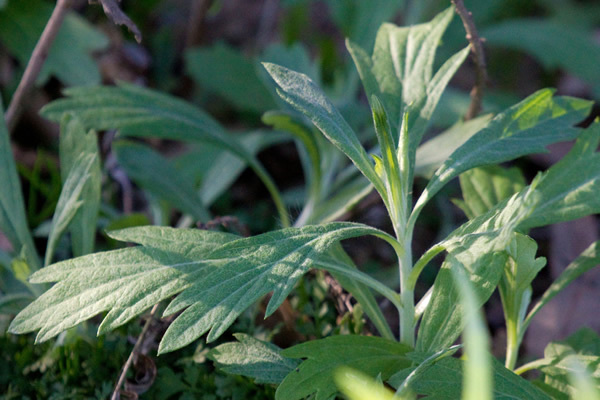 Mugwort has a pungent aroma when the leaves are crushed. In late summer the small reddish-yellow disk flowers cluster in long spikes at the top of the plant. Mugwort may reach to 6 ft (2 m) or more in height. This tenacious herb has naturalized throughout North America and may be found growing wild in rocky soils, along streams and embankments, and in rubble and other waste places, particularly in the eastern United States. In some areas, including North Carolina and Virginia, mugwort is characterized as a noxious, alien weed. Mugwort root is about 8 in (20 cm) long with many thin rootlets. It spreads from stout and persistent rhizomes. Mugwort leaf and stem are used medicinally. Mugwort acts as a bitter digestive tonic, uterine stimulant, nervine, menstrual regulator, and antirheumatic. The volatile oil of mugwort includes thujone, linalool, borneol, pinene, and other constituents. The herb also contains hydroxycoumarins, lipohilic flavonoids, vulgarin, and triterpenes. Mugwort acts as an emmenagogue, an agent that increases blood circulation to the pelvic area and uterus and stimulates menstruation. It is a useful remedy for painful and irregular menstruation. A compress of the herb has been used to help promote labor and assist with expulsion of the afterbirth. A mild infusion of mugwort is useful as a digestive stimulant. It is helpful in cases of mild depression and nervous tension. The herb also may stimulate the appetite. 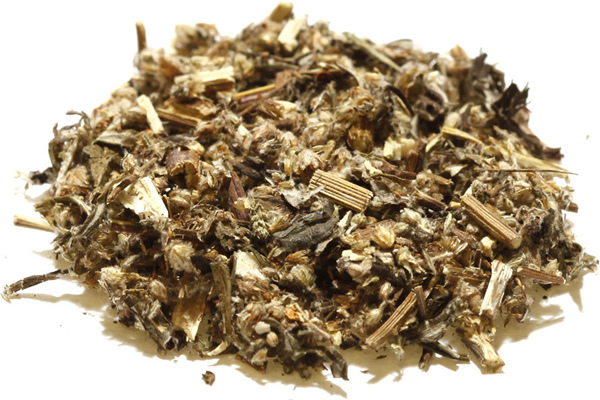 A weak infusion of mugwort has sedative properties that may quiet restlessness and anxiety. Its antispasmodic action may relieve persistent vomiting, and has been used in the treatment of epilepsy. Mugwort added to bath water is an aromatic and soothing treatment for relief of aches in the muscles and joints. In a clinical trial, crushed fresh mugwort leaves applied to the skin were shown to be effective in eradicating warts. Taken as an infusion, mugwort is helpful in ridding the system of pinworm infestation. Dried mugwort leaf also acts as a natural tinder, useful in holding a smoldering fire. The dried herb has also been smoked as a nicotine-free tobacco. A species of mugwort (A. douglasiana), common in the southwestern United States, was used by some western Native Americans as a prevention for poison oak rash. The fresh mugwort leaf was rubbed over areas of exposed skin before walking into poison oak habitat. The two plants often grow near one another. 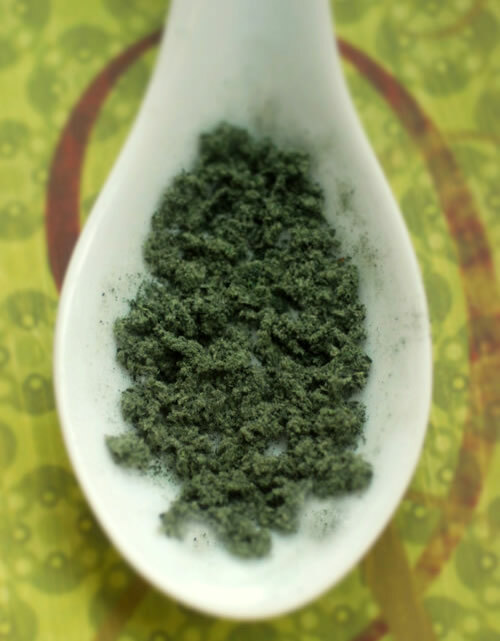 In Chinese medicine mugwort, known as Ai ye or Hao-shu is highly valued as the herb used in moxibustion, a method of heating specific acupuncture points on the body to treat physical conditions. Mugwort is carefully harvested, dried and aged, then it is shaped into a cigar-like roll. This “moxa” is burned close to the skin to heat the specific pressure points. It has been used in this way to alleviate rheumatic pains aggravated by cold and damp circumstances. Mugwort has also been used in various size cones that are places on the skin directly or on top of an herb or some salt and burned. In Japan, some practitioners only use moxa for treatment. A study published in the Journal of the American Medical Association reported on the successful use of moxibustion in reversing breech birth positions. The study found that 75% of 130 fetuses had reversed their position after moxibustion treatment of the mother. The technique is said to stimulate the acupuncture point known as BL67, located near the toenail of the fifth toe, stimulating circulation and energy flow and resulting in an increase in fetal movements. In Chinese medicine, mugwort is ingested to stop excessive or inappropriate menstrual bleeding. Mugwort has also been used in Brazilian folk medicine as a remedy for stomach ulcers. Researchers have found that the plant contains antioxidants which help to explain its protective effects on gastric tissues. More recently, mugwort has attracted attention as the source of a natural compound, artemisinin, which has been shown to have antimalarial properties. Artemisinin is a promising natural remedy for malaria because of its low toxicity and its effectiveness against drug-resistant mutations of the malaria parasite. In addition to its effectiveness in treating malaria, artemisinin is also being tested as a possible anticancer drug. A group of researchers in Mississippi has shown that artemisinin is toxic to several different types of human cancer cells. 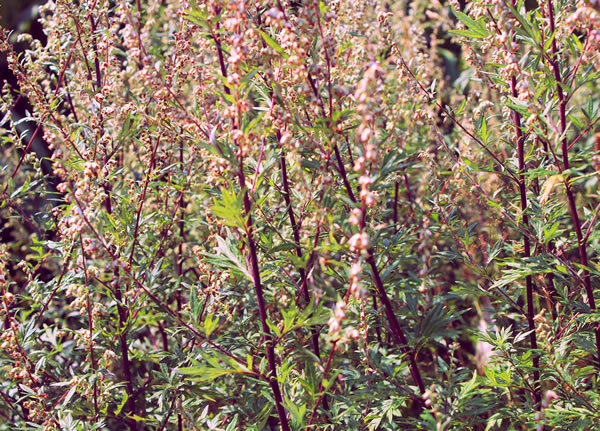 Mugwort is harvested just as the plant comes into flower, before the blossoms are fully open. The leaves are removed from the stalks and dried on paper-lined trays in a light, airy room, away from direct sunlight. The flower heads should be dried intact and the dried herb stored in clearly-labeled, tightly-sealed, dark glass containers. For infusion, 1 oz of fresh mugwort leaf, less if dried, is placed in a warmed glass container. One pint of fresh, nonchlorinated boiling water is added to the herb. The mixture is covered to prevent loss of volatile oils. The tea should be infused for five to 10 minutes. A mild infusion is best. After straining, it is recommended to drink two cups of mugwort tea per day. Use should be discontinued after six days. Four ounces of finely-cut fresh or powdered dry herb can be combined with 1 pt of brandy, gin, or vodka, in a glass container. The alcohol should be enough to cover the plant parts and have a 50/50 ratio of alcohol to water. The mixture should be kept in a dark place for about two weeks, shaking several times each day. It can then be strained and stored in a tightly capped, dark glass bottle. Dosage recommendations vary, with some herbalists cautioning against ingestion of mugwort in medicinal preparations. In traditional Chinese medicine, the herb is burned slightly in a pan before simmering with other herbs to stop menstrual bleeding. Mugwort should be avoided during pregnancy and lactation. The herb is a uterine stimulant. Women should avoid its use during lactation as the chemical constituent thujone may be passed to the baby through the mother’s milk. Mugwort should no be ingested if uterine inflammation or pelvic infection is present. 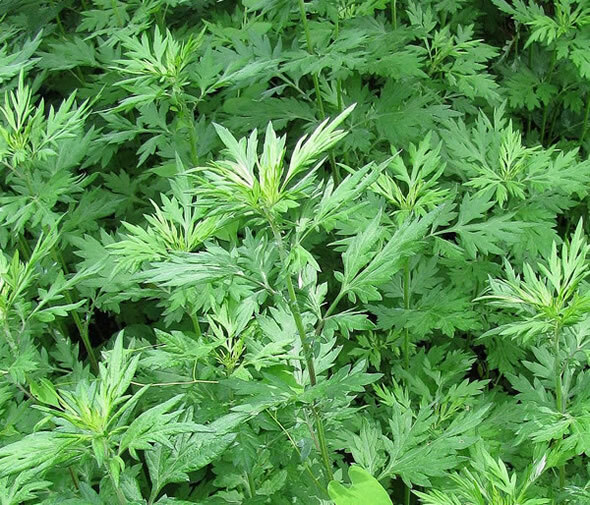 High doses of mugwort may cause liver damage, nausea, and convulsions. Some people develop a contact dermatitis, or allergic skin rash, if they are in contact with mugwort and certain other spices. This food allergy has been called the mugwort-spice syndrome, or sometimes the mugwort-celery-spice syndrome. Other foods and spices that are part of this syndrome include carrots, paprika, curry, cumin, birch, and pepper. In addition, mugwort pollen has been reported to cause asthma in susceptible children. People who are allergic to mugwort are also highly likely to be allergic to chamomile and should not take preparations made from either herb.